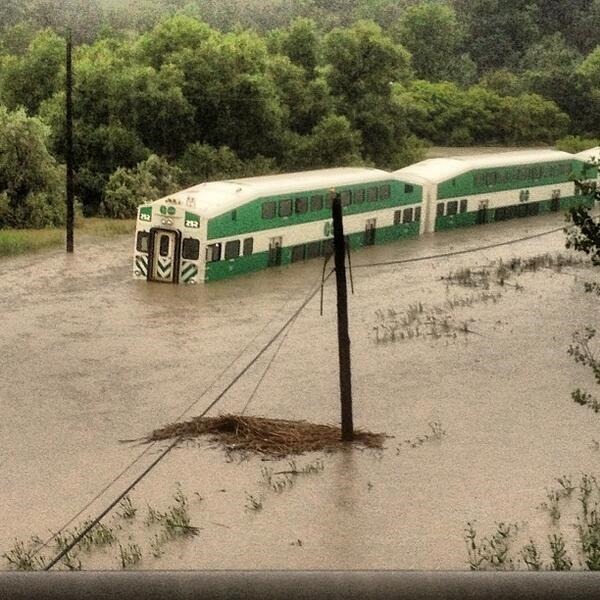 On Monday evening, Toronto was hit by a massive storm that resulted in a record 126mm of rainfall. 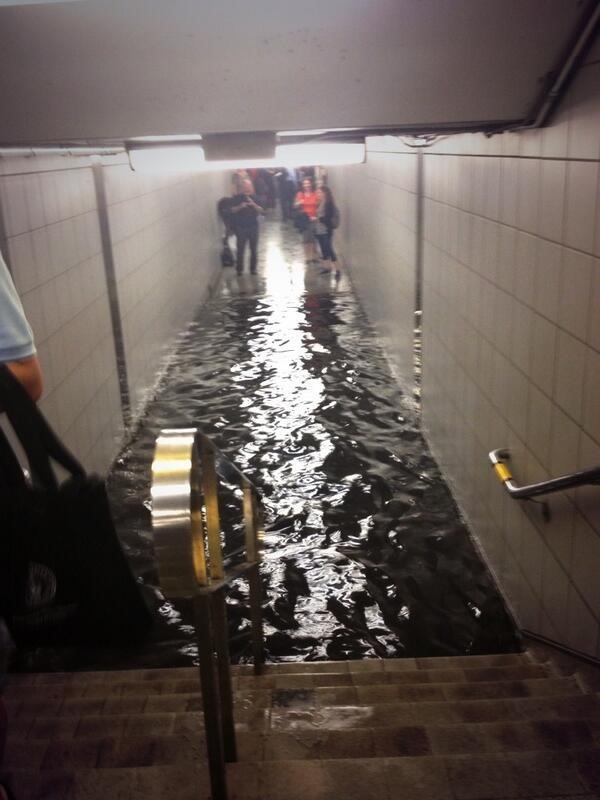 The city experienced massive flooding as a result, causing cars to become submerged, and train passengers forced to swim to safety. The city’s underground subway system was shut down due to the flooding, leaving tens of thousands of passengers stranded and 300,000 people were left without electricity after the storm – thousands of which are still blacked out a day later. 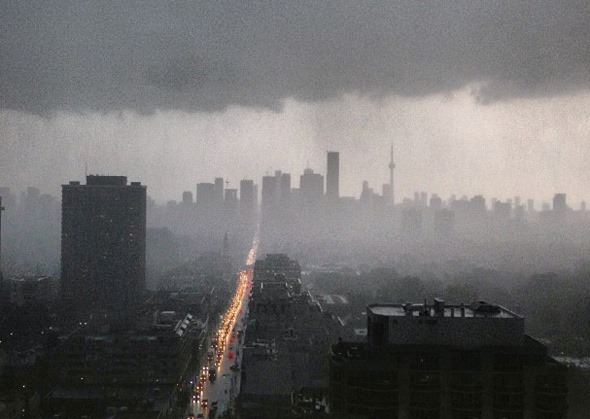 To put the 126mm of rain into perspective, Toronto’s average rainfall for the entire month of July is just 74 mm. The previous record for a single day of rainfall occurred in 1954 during Hurricane Hazel, which resulted in 121.4mm of rain on that day. Meanwhile, while tens of thousands of people were stranded or submerged in water, my evening was quite uneventful. Shortly before the storm arrived, I covered my Brooks saddle with the rain cover that my bike came with to keep my seat dry. At the time, I was working colleague who is visiting from Edmonton in a coffee shop. When the storm hit, we watched people sprinting through the rain as they passed the coffee shop, while others poured into the coffee shop to get out of the rain. When the worst of the storm was over, the power went out in the coffee shop, so we packed up our things and made our way to a restaurant to meet another colleague for scheduled dinner. When the dinner was over I went back to the coffee shop to grab my bike and pedaled to back to my neighbourhood in the rain to meet a friend who was in town just for one night. 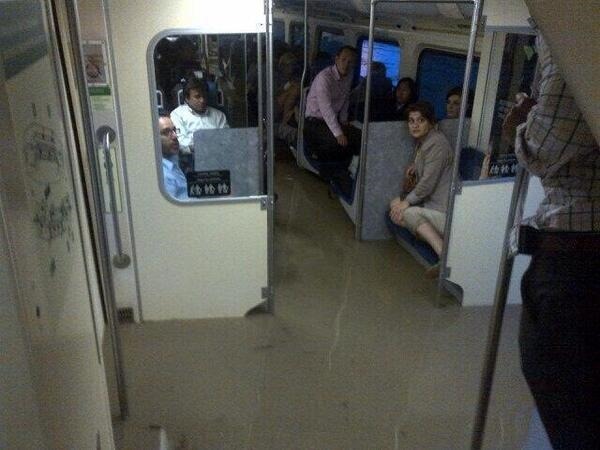 I passed by dozens of people who were waiting for transit, hours after the storm. I parked my bike at the restaurant, my friend and I had two drinks, and then we headed home. No floods, no swimming, no becoming stranded, no 4 hour commutes. Just an ordinary night in the life of someone who gets around using the most sensible, reliable mode of transportation: the trusty bicycle. “In the aftermath of the massive earthquake and ensuing tsunami that hit Japan on Friday afternoon, millions of people were left stranded at their workplace and tens of thousands displaced from their homes with few options to transport themselves to safety. Those who were unlucky enough to have an automobile at their disposal ended up in bumper-to-bumper traffic congestion – unable to get anywhere. Others who were able to leave the cities encountered impassable roads left in ruins. My experience was very similar to yours. I was home by 530pm, making dinner by 6pm. When the power went out shortly afterwards, I sat on my balcony playing around on my ipad (while the battery lasted) while having a few drinks. An additional plus: my bike is now shiny clean! Awesome! 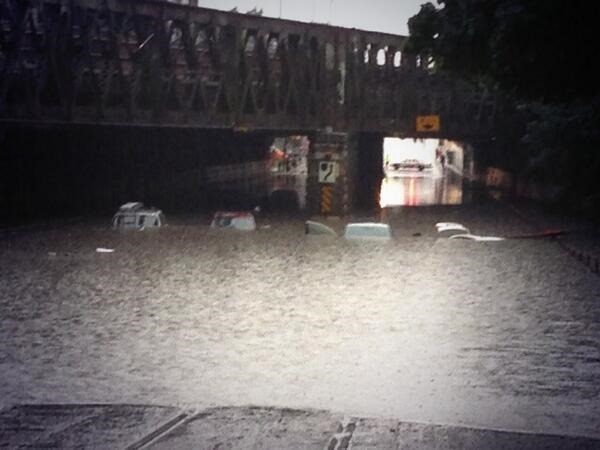 I didn’t even know there was flooding near our home until I saw it on Twitter late that night. There were certain underpasses that would have been impassable, but a bicyclist could have walked through the water and either pushed or carried their bike, or they could have taken a short detour to get around the affected areas. 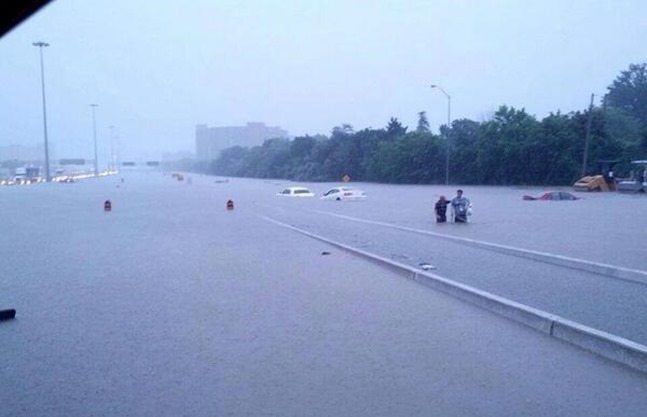 Thankfully the whole city wasn’t flooded – that would of course make bicycles ineffective. RE the last picture – has anyone actually tried cycling with an open umbrella? I would think you’d get blown over, or it would act as a drag chute. There are much more practical ways of warding off the rain while cycling, as this blog has noted in the past.